The CNC mill, or plastic CNC machining uses the technique of CNC, i.e. computer numerical control. This method of machining by material removal makes it possible to cut directly into the mass using digital milling machines. That is why this method is used for single productions in the right material, for example for functional testing. It is economical and fast for quantities of fewer than ten prototypes, because it does not require making a mould. It is also powerful, because it allows parts to be obtained in the right material with identical quality. However, CNC machining is not recommended beyond 10 parts, because the economies of scale generated are much less than with vacuum casting. The tools of vacuum casting allow for faster production. In addition, as CNC is a material removal technique, the cut pieces that are not usable represent an additional cost. The latter is proportional to the number of parts produced. CNC machining uses numerical control machine tools and milling machines with three to five CNC axes. These machines are automated and controlled by computer. Machining consists of removal of material; milling machines also are used for cutting into the mass according to the files that are saved to obtain the finished part. 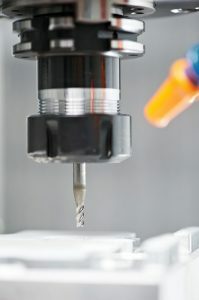 The 3D file entered into the computer allows the determination of the course of the milling machine, which cuts into the mass using the cutting tool of the milling machine, which allows milling in three dimensions to obtain the part. The milling machine makes a cutting motion (called cutting speed) and a feed movement (called feed rate) to ensure the manufacture of the prototype parts. Create a digital file of the desired part using appropriate software: CAD/CAM (Computer Aided Design/Computer Aided Manufacturing). This file determines the dimensions and geometry of the finished part. Connect the CNC machine to the computer: the input file controls the milling machine automatically. Place the block of material on the machine, held in place using hydraulic clamping. Leave the milling machine to operate, which will cut the desired part from the material. Remove the part and insert a new block if necessary. Finishing operation (polishing, painting, etc.). Find out more about the plastic machining process.